You're moments away from a chance to win £500 every Friday! Plus you can start every weekend knowing you are supporting disabled people and their families. How many entries would you like? 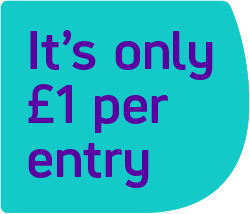 For each entry £4.34 will be debited every month. Your telephone number is especially important as it allows us to notify you of any issues with your account at the earliest opportunity. We’d like to keep in touch with you to tell you about the difference you’re making, as well as ways you can access or give support. How did you hear about the lottery? Licensed and regulated by the Gambling Commission. Licence No. 04920. www.gamblingcommission.gov.uk. Must be 16 or over to play. Underage gambling is an offence. £1 per entry. Promoter: Scope, Here East Press Centre, 14 East Bay Lane, E15 2GW. Responsible Person: Danielle Wootton. Registered charity no. 208231. All proceeds to Scope. Full terms & conditions can be obtained from www.scope.org.uk or from the Lottery Office, at the address above. If you feel you have a problem with gambling, visit begambleaware.org or call the National Gambling Helpline on 0808 8020 133.